“Today Was a Good Day” feels like The Chi viewers have been waiting on. Marcus Gardley’s script provides a level of focus and clarity that earlier episodes have lacked. Rather than doing their best in separated storylines, our four main characters are finally drawn together by a block party. 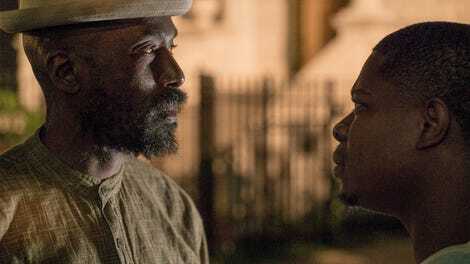 Without the intrusions of Detective Cruz and Quentin’s storyline becoming less of a mystery, The Chi is finally able to focus on the human moments that take the series beyond Chicago’s traditional gang narrative. The audience is finally allowed to get to know the men who make up The Chi outside of the deaths, murder and guns that brought their lives crashing together. “Today Was a Good Day” seems to be the best The Chi has to offer. The episode opens on a energetically shot montage of Emmett on his way to work. The series has hinted at Emmett’s natural business skills, but his deep connections to the community are on display as he charms his way down the street. Gardley’s script immediately cuts to Reg to offer a contrast of perspective. Reg and Emmett seem to be around the same age, but they’ve used their business skills to take incredibly different paths. While Emmett is great at his legit job, Reg manages a crew of gunrunners with the skill of a seasoned foreman. For Reg, this is just the everyday work he’s used to and that’s what makes it seem like a viable path for Jake. Jake, however, is still very much a kid. Of course he thinks it’s okay to take selfies during the pick-up, he doesn’t understand the consequences of what could happen if they got caught. There’s no time to be a kid in this line of work and he’ll be forced to lose his black boy joy if he hopes to become a shooter. Jake only sees the positives of running with his brother’s crew and is all too eager to assume those responsibilities. Whether Jake will follow his brother’s path or not is a far more interesting plot point than last episode’s focus on the abuse he endures from his brother. The power behind Reg’s position is what entices Jake and “Today Was a Good Day” allows Reg to seem like a viable mentor rather than just an aggressive drug dealer. Papa and Kevin have had more opportunities to just be kids in the show, but this episode reflects on the different ways they’re growing up. Papa (who is still horrifically underdeveloped as a character) still can’t lie to his mother and believes Jesus is watching his every move. It’s sweet and adorable; the kind of superstition kids that age hold dear. But, Kevin isn’t that naive. He’s shot someone and is willing to face danger, even if he doesn’t actually have the courage to stand up to it. As a rival gang holds Jake back when they try to cross their territory, Kevin’s fear is obvious as he runs away. He’s not ready for any of this either, but his curiosity is forcing him to act beyond his years. He has a level of maturity that Papa and Jake lack, especially when he decides to let Maisha borrow his bike. But this same maturity is what caused him to get taken advantage of by Ronnie. Unlike Jake, however, Kevin seems to have a positive role model in Brandon and the inevitable clash between the two boys will be an interesting development. Brandon is already The Chi’s most valuable player, but “Today Was a Good Day” solidifies his place as the show’s best character. At this point in the series, we’ve only seen Brandon react to the events going on around him. He has to deal with Coogi’s death. He has to deal with his mother. He has to deal with the stress of his job. But in this episode, Brandon just gets to be Brandon as he drives around high with his cousin. In opposition to the last episode, when he has a stressful interaction with cops, this week, there’s clear sarcasm when the two men are pulled over. His cousin gleefully replies “Yes, officer” and “No, officer” while Brandon hides a blunt and they make jokes about who Brandon should sleep with next. While it makes little sense that Jerrika would move on so quickly or that Brandon wouldn’t try to explain the gun and blood, it’s nice to see him as a character outside of his responsibilities. And then, there’s Ronnie. If Reg and Emmett work as contrasts this episode, Ronnie is placed in opposition to Brandon. His character only starts to make sense when we understand the responsibilities placed on him. Ronnie is better served when his plot relates to Tracy or his grandmother, rather than when he’s aimlessly wandering the streets with his friends or threatening children. Ronnie does the things he does for Tracy and his grandmother. The stronger these relationships are presented, the less I want Ronnie to immediately go to jail. Ronnie finally gets his moment with Brandon and it seems as though this is the end of their conflict, but we’ll see if Detective Cruz comes back into the picture next week. I did not miss Detective Cruz and I’m happy his departure gave other characters room to grow. During the neighborhood block party, gunshots start to ring out. “Respect life,” one of the DJs says. For the characters of The Chi, we’ve already seen that guns, gunshots and gun running are a way of life. “Today Was a Good Day” gives us a glimpse of the relationships, responsibilities and joys that also make up their lives. Barton Fitzpatrick does some stellar work in this episode as Reg. It’s confirmed that he’s aware of Quentin and is plotting his own moves. Time will tell if he has the smarts to take Quentin on, but then again, we don’t really know what Quentin is capable of (...I guess he’s good at stealing dogs?). Seriously, why would Brandon think he should act like a macho man in this situation? Like, Brandon, you are clearly in the wrong here. I need more chill depictions of black men smoking weed and just hanging out. Watching Brandon and his cousin goof around felt like a breath of fresh air. I love Ronnie’s grandmother. I still wish we could see more of Tracy outside of Ronnie’s interactions with her. This episode had some weird musical cues. The scene of Kevin going to the projects to talk to Maisha was wonderfully done, but what was that weird stock music when Quentin went to recruit his auto shop buddy? Visually, “Today Was a Good Day” is some of the show’s best work. Why was Jerrika at the block party? Doesn’t she live in a different neighborhood. She’s from “the other side of the tracks,” why would she go to her ex’s neighborhood block part with a new guy? The only mother at the block party was Tracy. We don’t see Laverne, Emmett’s mom or Kevin’s moms or sister. I’ve stopped expecting The Chi to treat its female characters with depth, but like, damn, we can’t even get drunk Laverne hanging at the block party? Can’t these women exist even a little bit outside of the men they interact with?